I spent five days in Puerto Rico in March of 2019. My stay was especially charming given the blend of tropical weather, pristine beaches, and a vibrant, buzzing atmosphere in Old San Juan. Some highlights not to be missed for a visit are: a catamaran ride to Culebra Island, walking the length of Flamenco Beach to see abandoned tanks, kayaking in the dark to a bioluminescent bay, and trying your own hand at making mofongo, a plantain based native dish. Oh, and did I mention 85% of the world’s Bacardi rum is produced here, at their distillery on the island? Whether you’re here for a meal or simply wandering the streets, be sure to stop by Fortaleza Street (you probably won’t miss it). The street is covered with colorful umbrellas, though they were all pink when I was here to raise awareness for domestic violence. First settled in the 1500s, Old San Juan is the original colonial site of the many countries who have claimed it over the past centuries. Even today, there are still plenty of streets that were laid with the original stones used to weigh down the ships from the Old World. Upon arrival in port, these ships would unload their weights before setting off again, and cobblestone pathways were laid with the rocks left behind. The vibrancy of Old San Juan can also be seen through the colorful colonial houses that line its streets. Every twist and turn presents an opportunity for variegated photos of the town. Next up, a few not-to-be-missed eats in the area. Cafe el Punto serves up a tasty empanada filled with beef. Walk into the alleyway and there is also a favorite ceviche joint waiting for you as well. A classic dish native to Puerto Rico - mofongo can be found on nearly every menu of any joint that claims to serve local cuisine (and if not, you might want to reconsider eating there). The dish is primarily made up of mashing plantains with garlic, and adding in some form of protein. Usually it’s also enjoyed with rice & beans (surprise!) on the side. Yes, this is the Carribbean, which naturally means it will be warm. With warmth comes a proliferation of outlets peddling your ice-creams, gelatos, and other cold treats. But one icy delight not to be missed in San Juan is Señor Paleta, if the usual line out the door doesn’t tip you off. These popsicles are made with real fruit - try the passionfruit one for unabashed sweetness with a delightful sour kick. Finally, if you’re looking for a more decadent dessert experience in Old San Juan, look no further then Chocobar Cortés. 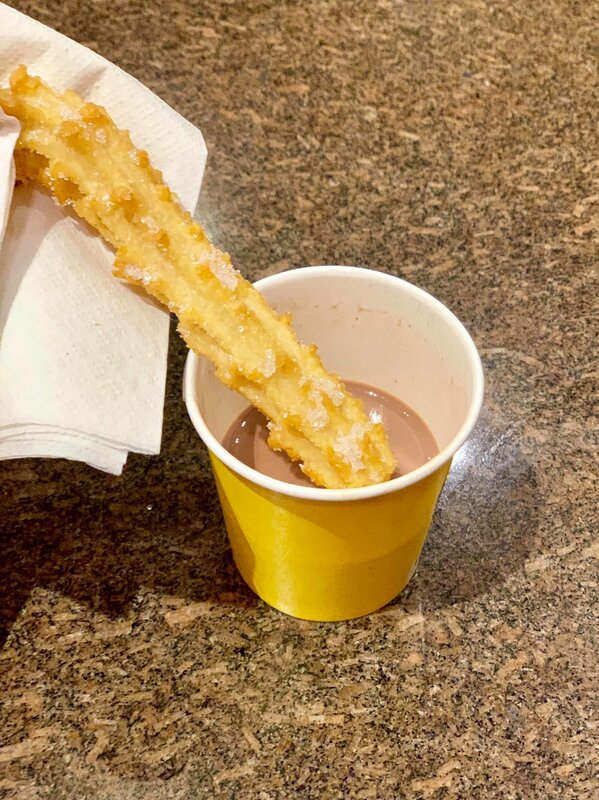 Not to be missed are their cups of hot chocolate, with consistency reminiscent of their Catalonia counterparts. Thick, creamy cups of goodness, paired with churros (of course), or, wait for it - cheese. If, after all that food, you need a bit of a hike - stroll to Plaza de Armas - supposedly site of the original tinder. Long ago, matching making would occur in the square during Sunday markets. Conservatism at the time dictated that young women couldn’t speak directly to men, so daughters would indicate interest to their accompanying fathers as they potential bachelors passed by. The fathers would then take note and set up the appropriate introduction. At the time, a fan was used as the signaling tool - if the girl fans herself on her right side, it was an indication of interest, and if on the left, you guessed it, that was a pass. Today, the square is also home to performing artists as well. Once prized as a easily defensible and centrally located gateway to the rest of the Caribbean, many battles have been waged over this valuable settlement, and two major forts constructed as a result. One activity I highly recommend, and extremely popular in P.R. among tourists, is kayaking to a bio-luminescent bay to see glow in the dark algae. Sounds weirdly specific, I know. There are three places on the island to do this, with Mosquito Bay being the brightest but farthest away from San Juan - on the southern shore of the island of Vieques. We opted for proximity and went to the second brightest: Laguna Grande on the Eastern edge of the main island, in Fajardo. We arrived to a shallow bay area to embark on the rest of our journey by canoe. Though one can’t see it, the ones lined up in the distance have glass bottoms - though truth be told, the clarity is closer to scratched plastic (which it probably is). A little instruction before it’s go time. Not going to lie, the distance between the bay and the lagoon, especially avoiding the dense mangrove branches on the way, is rather tough. PSA: You can’t be more than 190 lbs and use one of these canoes. They are strict about this because the ‘glass’ bottom ones will sink under extra weight - as you can kind of see in the photo below. Finally, after what felt like hours of paddling, we arrive into the open water and glide into the lagoon, moments before sunset. Even at the peak of the luminescence, the dream like glow in the water, of the water, I should say, is near impossible to capture on camera. The following video out of my multitude of attempts gives you a glimpse, and is best seen in dark room with brightness turned all the way up. Culebra Island boasts what is arguably Puerto Rico’s prettiest beach. Many tours and boat charters will take you to the island, stopping nearby to snorkel first. To get to Culebra - we opted to take a catamaran (with an engine). This is a picture of the dude driving it. Note that even on a calm day, it can be a bumpy hour-long ride there from the mainland, so keep that in mind if planning to go. Though the variety of fish and coral don’t compare to places like Hawaii and the Great Barrier Reef, it was a fun few hours of peeking underwater nonetheless!